Jay Tew of the Hanger Clinic helps Gustav (6 yrs. ), a below the knee amputee, put on his shoes. After further inspection, Jay discovers that the shoes were already to small for Gustav and gave him a new pair. Gustav and his mother travels hundreds miles to the clinic to get treatment. Hanger Clinic in Deschapelles, 120km from Port Au Prince, had provided artificial limbs to more than 500 earthquake victims. 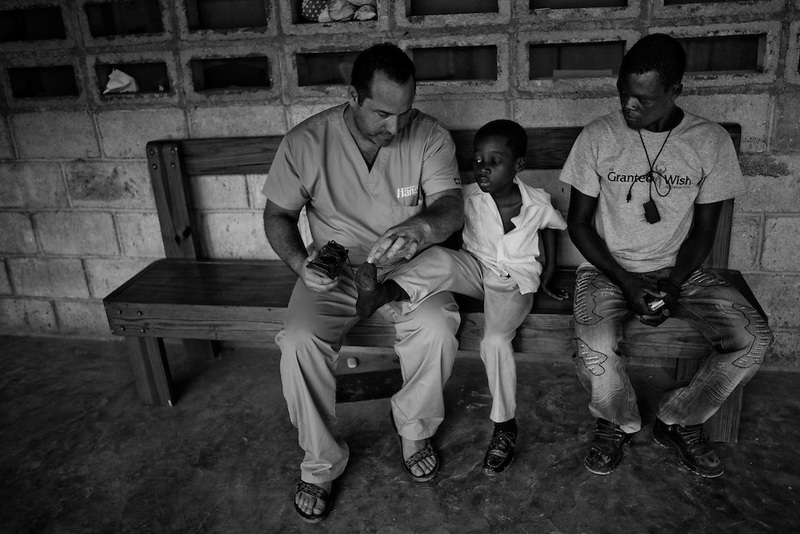 The clinic also employs Haitians with few foreign specialists who volunteers two weeks at a time. On average, the clinic helps 40 patients per day with prosthetics, physical therapy, adjustment and repairs, and counseling for free. Their funding and support comes from Hanger Orthopedic Group, Hanger Ivan R Sabel Foundation, Hospital Albert Schweitzer (HAS) and private donations. Many patients travel hundreds of miles to the clinic to get treatment. The clinic arranges transportations and offers lodging for patients needing to stay longer.